Under-the-chin fat doesn’t stand a chance with CoolShape – a powerhouse combination of two non-surgical procedures. Fans of CoolSculpting® may already be familiar with the CoolMini™ applicator which is perfectly sized to target smaller areas. Contour Dermatology has teamed the procedure with smoothing and tightening VelaShape III laser treatments to achieve maximum results. The CoolMini is FDA approved to reduce fat under the chin. It is a simple fat freezing procedure like standard CoolSculpting, but with a small area hand piece that tucks perfectly beneath the chin. To learn more about the CoolMini treatment, click here. VelaShape III utilizes radio-frequency, mechanical suction and heat to smooth and tighten skin. Performed on the lower face and neck, it’s also great for reducing cellulite and inches around the abdomen and thighs. Generally there are no side effects, although some short-term localized redness may occur. To learn more about the VelaShape treatment, click here. A CoolShape Mini Package is comprised of two CoolMini treatments spaced two months apart that target under-the-chin fat. They are combined with six VelaShape III treatments for the same area beginning weekly after month one. 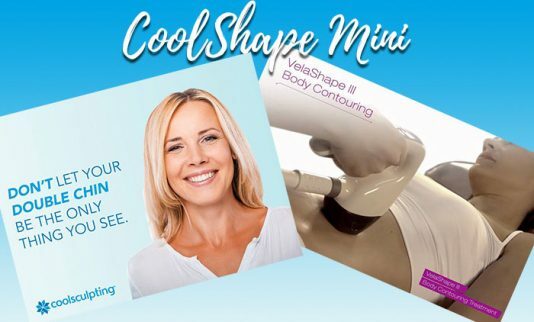 Opting for the CoolShape Mini Package results in approximately a 20% cost savings. Call us today at (760) 423-4000 to schedule your consultation, or schedule a consultation online. This was my first visit to Contour Dermatology. I was very pleased with the office staff, and their courteous demeanor. I was especially pleased with Dr Jochen, he was kind and very caring, but most of all was very educated, and a very confident doctor. After caring for my skin and face for many years, I was very pleased to find Dr. Jochen and his staff. Will absolutely go back for more treatments.